The recoilless rifle barrel I received for review is designed to replace plastic parts in Academy M151A1 model (#13003). There is one error however in both Academy kit description and in Model Point product name (only on the label on the product packaging - it has been corrected on Model Point US website): the rifle is described as 105 mm, while in fact what we get in the kit and in the Model Point set is a 106 mm M40A1 recoilless rifle. US Army used 105 mm M27 recoilless rifle in the 1950s, but it looked different. I currently do not have this particular Academy M151A1 kit variant in my collection, so I was not able to make direct comparison of aluminum barrel to this kit's part. But I thought that it can be interesting to see whether Model Point barrel can be used as a replacement for recoilless rifle barrel in another Academy kit - M113A1 Vietnam model, in which 106 mm recoilless rifle is also included. Aluminum barrel is composed of two parts, which telescopically attach to each other. The fit is very good and only a tiny drop of super glue is needed to securely assemble them. I compared the machined details on the barrel with photos of real M40A1 rifle and they seem accurate. And judging from photos on Academy website they also seem to be exactly the same as on plastic barrel included in M151A1 kit. No instructions are provided, but there are really none needed. I don't know how parts are molded in M151A1 kit, but if they are similar to those in M113A1 kit, then little surgery is needed to "transplant" some details molded integrally with the plastic barrel, like spotting rifle, to the metal part. It should not be very difficult, but care is needed to avoid damaging these details. 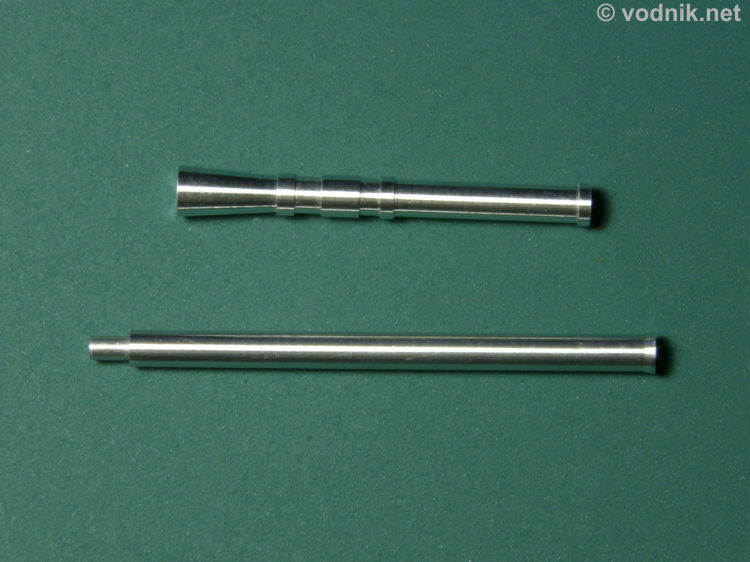 On the picture you can see that Model Point barrel can easily be used as a replacement for the M40A1 barrel from M113A1 kit. Dimensions are exactly the same and all details are in the same spots. 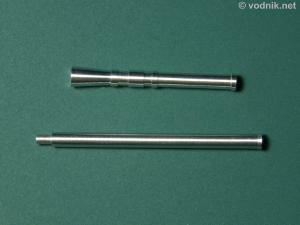 The only difference is the shape of the muzzle - in M113A1 kit part it is cylindrical, while in metal part it is conical. 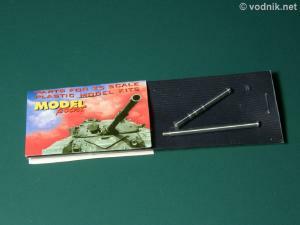 Barrel in Academy M151A1 kit also has a conical muzzle. I found pictures of rifles with both types of muzzles, so both seem to be accurate (maybe earlier and later version?). and aluminum barrel from Model Point. Model Point barrel requires some work to replace kit parts, but saves a lot of effort needed to eliminate the seam along the plastic barrel. The barrel can be easily used with M151A1 kit to replace 106 mm rifle barrel included in this kit, but can also replace barrel from M113A1 kit. Many thanks to Dmitriy Li of Model Point US for the review sample!